For most salaried individuals, the Employees’ Provident Fund (EPF) forms the backbone of their savings needs. The scheme is now undergoing sweeping changes. Apart from recent tweaks in rules, new measures proposed could change the very structure of the EPF. So will the changes enhance the utility of the EPF or leave subscribers handicapped? In the absence of a dependable pension offering, the PF serves as a nest egg for private sector employees. However, with many dipping into their PF kitty much before retirement, it often leaves the subscriber without a vital savings pool in their twilight years. A few years ago, the Employees’ Provident Fund Organisation (EPFO) had ruled that partial early withdrawal would only be permitted on occasions like a child’s marriage, higher education and making a downpayment for a house, subject to certain conditions. Members are also allowed to withdraw the entire amount and opt for final settlement if they remain unemployed for more than two months. The EPFO has now changed rules for withdrawal in the event of loss of job. Members will be allowed to withdraw 75% of the accumulated corpus after a month of termination of service. If unemployed for two months, the member will have the option to withdraw the remaining 25% and go for final settlement. Financial planners say restrictions on withdrawals will ensure retirement is not compromised. Until recently, the EPF generated returns entirely from investments in fixed income instruments like government securities and corporate bonds. Three years ago, the EPF entered the stock market, deploying a nominal 5% of the incremental corpus in equity exchange traded funds (ETF). The equity exposure has since been gradually hiked to 15% of the incremental corpus. In future, the subscribers may be given the option to deploy a higher portion of their EPF contributions into equities. At the same time, risk-averse subscribers may be given the option to reduce their equity contribution. Financial planners say the option to hike equity allocation can help deliver a healthier retirement corpus to subscribers. “Equities tend to yield better returns compared to debt instruments over longer time frames. The hike in equity allocation in EPF will help subscribers fetch a higher return on their corpus,” says Amol Joshi, Founder, PlanRupee Investment Services. It would particularly benefit younger subscribers who have a higher risk appetite owing to the longer time horizon. They can step up their equity exposure from the early years and gain from the power of compounding. “For many individuals who consciously stay away from equities, the EPF may be the only way to participate in this high-growth asset class in a responsible manner,” says Sadagopan. As of May-end, the EPFO has invested nearly Rs 47,500 crore in equities, earning a return of 16.07% on the investment. Another proposal is to widen the scope of ETF investments beyond the frontline indices. However, some experts feel increasing exposure to equities is not a good idea. Pankaaj Maalde, a certified financial planner, says the volatility in equity returns will lead to fluctuations in yearly returns from the EPF. He insists that those seeking higher equity exposure should be given the option to shift to the National Pension System (NPS). Last year, the EPFO approved a change in the accounting policy for the portion of EPF invested in equities. The corpus parked in ETF will soon be credited to subscribers’ accounts in the form of units. These units can be redeemed by the subscriber when he or she exits the fund or withdraws the money. Meanwhile, earnings on the debt portion of EPF will continue to be paid as interest. Accordingly, each subscriber will have two account heads under EPF—fixed income and equity. Currently, the return on the equity part is not factored in while calculating the interest declared every year. It also does not reflect in the subscriber’s PF account. Once the unitisation of PF balance is implemented, the value of every subscriber’s equity holdings will be marked to market. Additionally, the subscriber would get the option to defer the withdrawal of the equity investment for up to three years. Some financial planners say unitisation will usher in greater transparency in the valuation of the scheme’s holdings. “Unitisation will take away some of the anomalies in the accounting practices,” says Shah. However, others say this will shift the onus of risk onto subscribers. Says Maalde, “Once the scheme is linked to the market, the EPF will not be in a position to give fixed returns to the subscriber.” Besides, regular visibility of the performance of the equity portion may push subscribers into making hasty decisions. The Employee Pension Scheme, which runs parallel to the EPF, is also likely to see some changes. At present, employees earning up to Rs 15,000 a month are eligible for a minimum guaranteed pension of Rs 1,000 per month after retirement. All members become eligible for pension after 10 years of contribution to EPS. While employees contribute 12% of the basic pay to EPF, the employer has to make a matching contribution, divided into two parts: 8.33% of the basic pay is directed towards EPS—subject to a cap of Rs 15,000—and the remaining 3.67% is parked in EPF. The labour ministry may enhance the wage ceiling from Rs 15,000 to Rs 21,000. The retirement body is also considering doubling the minimum monthly pension for EPS subscribers to Rs 2,000. While this will bring more subscribers into the pension net, it is still too meagre an amount. As per the current structure, pension is fixed based on the following formula: Average salary for the last 5 years x number of years completed in service / 70. Since the definition of salary is restricted to Rs 15,000, the maximum contribution works out to Rs 1,250 per month (8.33% of salary). This will climb up marginally to Rs 1,750 if the wage ceiling is enhanced to Rs 21,000. Besides, the final pension is also computed on this wage ceiling, which puts a cap on the pension amount. Assuming an employee has served 35 years, the maximum monthly pension he can get today is Rs 7,500. Currently, there are around 60 lakh pensioners under the EPF-95, of which around 40 lakh are getting less than Rs 1,500 per month as pension. The EPF may also be indirectly impacted by possible tweaks in the structuring of employee’s salary. According to reports, the government wants to cap allowances to employees at 50% of the basic pay. This proposal aims to make basic income a major component of the employee’s salary structure. Often, employers keep basic pay very low to ensure that the contribution towards social security schemes is also moderate, cutting down on company’s costs. If basic income is raised, it would result in higher contribution towards EPF, apart from other social security schemes. Both the employer and employee contribute 12% of the basic pay and dearness allowance, if any, towards the EPF. Effectively, the rise in basic income may lead to a lower take-home pay for employees while the PF contributions will see a jump. If implemented, this will enhance retirement savings. The EPF has seen some procedural tweaks in recent years. The EPFO has tried to simplify the subscriber’s interaction with the retirement body by offering services online. The introduction of the Universal Account Number or UAN is set to reduce complications during withdrawals and linking multiple PF balances. Once you are assigned a UAN, when changing jobs, sharing the UAN with the new employer will enable them to get your entire PF balance transferred to the new account. 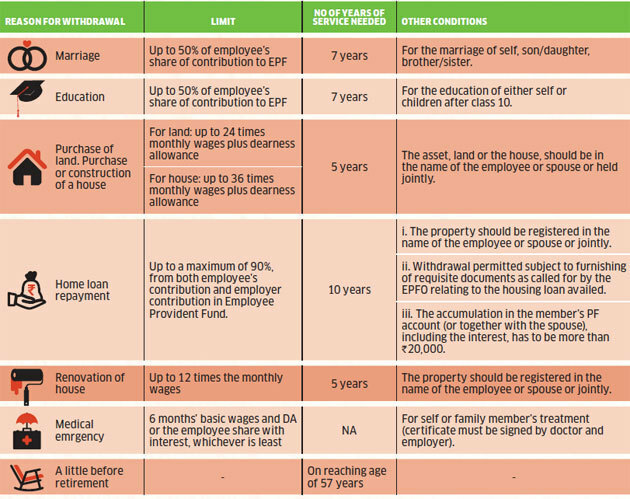 With its tax benefits, the EPF has an advantage over other savings vehicles. Apart from the income tax deduction allowed on employer’s contribution to the EPF, the interest income is entirely tax free. The interest rate itself continues to be several notches higher than comparable government instruments. At 8.55%, the interest rate for the year 2017-18 is the lowest in five years. Yet, it has remained elevated relative to the cuts witnessed in instruments like the PPF and NSC. “Considering the tax savings, the EPF effectively delivers a pretax return of around 12% for those in the highest tax bracket,” points out Shah. The PPF rate has slipped more. 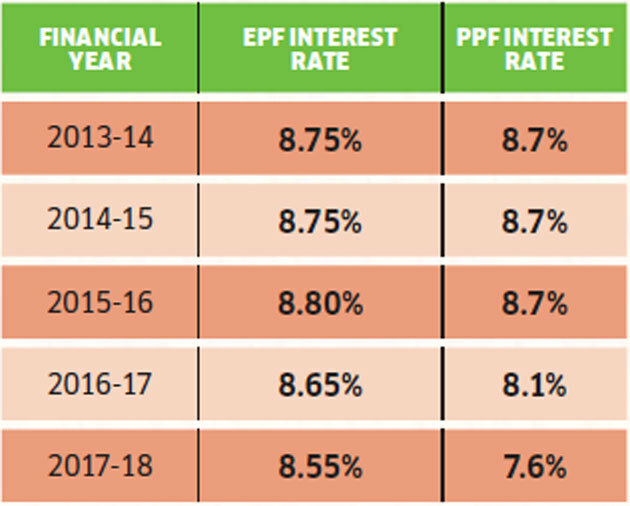 Subscribers can count on the EPF to offer competitive interest rates in the future. However, the introduction and hike in equity exposure along with the planned unitisation of the equity component pose some risks. Yet, most financial planners insist subscribers should make the most of the instrument and stay the course. Joshi says one should refrain from withdrawing money prematurely and remain put till retirement. However, Maalde suggests shifting from EPF to the NPS. Under the NPS, there is greater choice over allocation of savings unlike the EPF, he argues. 1. Go to the EPFO’s Unified Member Portal for UAN related services. 2. Select the ‘Know your UAN status’ option under ‘important links’ section. 3. Enter details like member ID or EPF account number, name, date of birth, phone number and email. EPF member ID is printed on your salary slip. 4. You will get an authorisation PIN on the registered mobile number. 5. After entering the PIN, your UAN will be sent to the registered mobile number and email.